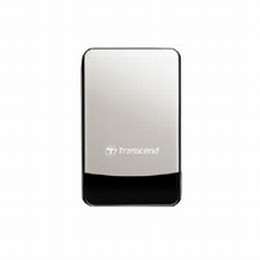 Transcend's StoreJet 25C is designed for business travelers and people who need a bolder, more elegant way to carry their data. Its compact size (124mm long by 78mm wide and just 14mm thick) and strikingly sleek appearance are bound to capture attention. A true piece of fashion technology, the SJ25C boasts huge storage capacity and a luxurious polished stainless steel case with piano-gloss connection panel. The SJ25C also features a distinctive textured backing that not only provides a stable non-slip base for absorbing vibrations while resting the drive on a table, but also adds to the drive's stylish character and enhances tactile feel. Despite its compact size, the SJ25C has up to 500GB of storage space so users can easily transfer, store, and share important files and data.